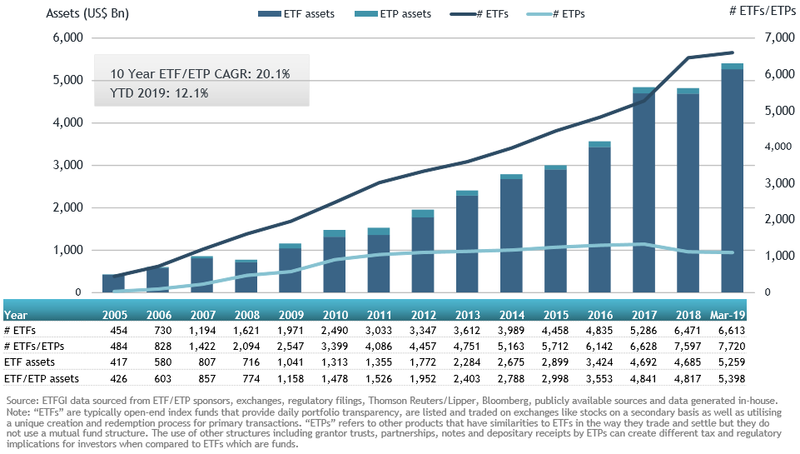 ETFGI reported that ETFs and ETPs listed Globally gathered net inflows of US$37.48 billion in March, bringing year-to-date net inflows to US$99.14 billion…..
Assets invested in the Global ETF/ETP industry reach a new record US$5.40 Tn. April 11th marks the 19th anniversary of the listing of the first ETF in Europe. Assets invested in the Global ETF/ETP industry rise 1.41% in March. During March 2019, ETFs/ETPs listed Globally attracted $37.21 Bn in net inflows. 62 consecutive months of net inflows into ETFs/ETPs listed globally. “Markets appear to have returned to the relative calm they had grown accustomed to over the past few years. Returns for developed indices decelerated in March, as the effects of more cautious and accommodative central bank policies lose steam. The S&P 500 finished March up 1.94%, with year-to-date returns of 13.65%, marking its best quarter since ‘09. The S&P Europe 350 rose 0.92% in March, as economic data from the region continues to send mixed signals, bringing year-to-date returns to 10.90%. The Topix 150 in Japan was up 0.32% in March, bringing year-to-date returns of 7.96%. Emerging & Frontier returns continued to outpace developed markets. The S&P Emerging BMI and Frontier BMI finished March up 1.74% and 1.37%, bringing year to date returns to 10.45% and 8.82%, respectively.” according to Deborah Fuhr, managing partner and founder of ETFGI. April 11th marks the 19th anniversary of the listing of the first ETFs in Europe. European Exchange Traded Fund Company launched two listed diversified return securities (LDRS) on the Deutsche Borse. These funds are co-managed by Merrill Lynch and track the Dow Jones Euro Stoxx 50 and Stoxx 50 indexes. At the end of March 2019, the Global ETF/ETP industry had 7,720 ETFs/ETPs, from 412 providers listed on 72 exchanges in 58 countries. Following net inflows of $37.21 Bn and market moves during the month, assets invested in the Global ETF/ETP industry increased by 1.41% from $5.32 Tn at the end of February, to $5.40 Tn. Equity ETFs/ETPs listed Globally attracted net inflows of $16.51 Bn in March, bringing net inflows for 2019 to $36.30 Bn, substantially less than the $100.52 Bn Mn in net inflows equity products had attracted by the end of March 2018. Fixed income ETFs/ETPs listed Globally attracted net inflows of $17.98 Bn in March, bringing net inflows for 2019 to $56.36 Bn, considerably greater than the $17.48 Bn in net inflows fixed income products had attracted by the end of March 2018. Substantial inflows can be attributed to the top 20 ETF’s by net new assets, which collectively gathered $30.49 Bn in March, the iShares Core S&P 500 ETF (IVV US) gathered $7.19 Bn alone. The top 10 ETP’s by net new assets collectively gathered $957.49 Mn in March. the VelocityShares Daily 2x VIX Short Term ETN (TVIX US) gathered $333.76 Mn. Investors have tended to invest in large cap equity/fixed income ETFs in March. ETFGI is a leading independent research and consultancy firm covering trends in the global ETF/ETP ecosystem, based in London, England. 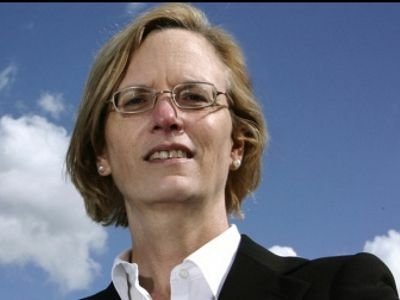 Deborah Fuhr, Managing Partner, Founder, ETFGI website www.etfgi.com.